A service of remembrance was held today at Newby Hall to mark 150 years since the Newby Ferry Disaster which occurred on the 4th February 1869. 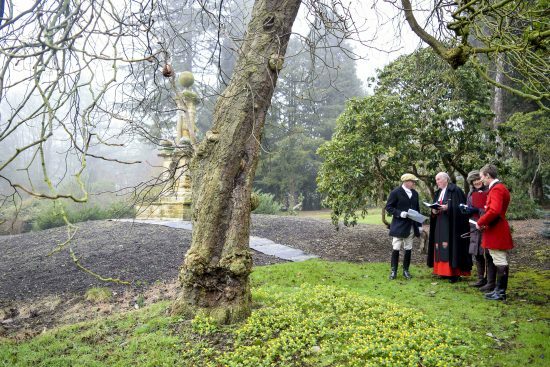 The disaster, which claimed the lives of 6 men and 11 horses is marked in the gardens with the Newby Ferry Memorial within the Woodland Gardens and it was here that 200 people came to pay tribute to the lives lost that day. Richard Compton, owner of Newby Hall greeted the crowd, and the service was taken by Canon Richard Cooper, Chaplain to the Queen. A History of the Disaster was read out by Charles Dent, followed by readings by Jenny Dangar and Peter Greenwood. Sam Townend, a Huntsman from the York and Ainsty Hunt finished the proceedings by ‘Blowing for Home’, the traditional call for the end of the hunt. Several ancestors of those men who lost their lives along with those who survived attended the service. The hunt got under way at eleven o’clock at Stainley House near Harrogate. A short while later some hunters and horses chased a fox across a ford over the river, whilst the remainder of the hunt headed for a ferry boat almost directly opposite Newby Hall. James and Christopher Warriner from Skelton-on-Ure were in charge of the boat used that day to transport huntsmen and horses across the River Ure near Newby. Sir Charles Slingsby and his horse darted first into the boat, followed just as inelegantly by twice as many occupants as the boat was designed to carry. Encumbered by a fast moving current and river swollen by heavy rain, the group made for the other side. About one third of the way across Sir Charles Slingsby’s horse kicked the mount belonging to Sir George Wombwell. Wombwell’s horse returned the kick and caused other horses to panic and thrash around and lose their balance. The violent motion caused the boat to overturn, throwing its occupants into the water where the six men and eight horses died and some of the strongest swimmers escaped or were saved by spectators on the river banks. Of the six men who died, only Charles Slingsby was seen to emerge from the water and begin swimming to safety, only to give up a short distance from the river bank. Mr. Vyner pulled himself on top of the overturned boat and was able to drag Sir George Wombwell (who could not swim) out of the swirling current, as well as Captain Mussenden, who had been cut on the head by a blow from one of the horses. An inquest held a few days later at Newby Hall, returned a verdict of accidental death.